On July 1, the Centers for Medicare and Medicaid Services (CMS) issued its proposed CY 2016 payment rate regulation for hospital outpatient departments (HOPD) and ambulatory surgery centers (ASC). The proposed regulation will soon be published in the Federal Register, after which time OOSS and other interested parties will have an opportunity to submit public comments. Below, please find a brief summary of key components of the proposed rule. A more detailed summary will be provided shortly. Under the ASC payment system, facilities receive a percentage of the relative weight assigned to a code for procedures furnished in HOPDs. The relative weights are re-calibrated each year based on a complex formula that takes into account a number of factors, including changes in hospitals’ costs in providing such services and the mandate that the ASC payment system remain budget-neutral. Again this year, the 2016 proposal contemplates an inflation update for ASCs; CMS is providing an update based upon the Consumer Price Update –Urban (CPI-U), which the agency estimates to be 1.7 percent. However, most health care providers will incur a “productivity adjustment” against their cost of living updates; CMS estimates that this adjustment will be 0.6 percent, which would result in a 2016 ASC positive payment rate of 1.1 percent. For the first time, ASCs will have a HIGHER, not lower rate than than hospitals. Although the government has once again rejected the ASC community’s recommendation that facilities be paid on the basis of the same update factor provided hospital outpatient departments, the agency has acknowledged that the CPI-U may not be the best inflator for ASCs. OOSS and the ASC and ophthalmology communities will continue to vigorously lobby for the higher Hospital Market Basket update factor to be applied to ASCs. Effective October 1, 2012, facilities commenced reporting data with respect to the following measures: patient burns; patient fall in the ASC; wrong site, wrong side, wrong patient, wrong procedure, wrong implant; hospital transfer/admission; and, prophylactic IV antibiotic timing. As discussed in prior Updates Online, facilities are also required to report through CMS’ QualityNet website data respecting procedure volume and use of a safe surgery checklist. By August 15, ASCs will also be required to report data regarding influenza vaccine coverage among healthcare personnel on the National Healthcare Safety Network (NHSN) website. 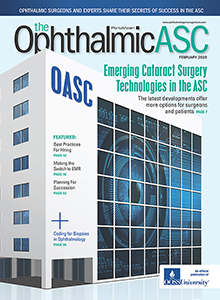 You will recall that, last year at the urging of OOSS, ASCRS, and AAO, the agency decided to transition ASC-11, Improvement in Patient’s Visual Function Within 90 Days Following Cataract Surgery, from mandatory to voluntary reporting. OOSS and the ophthalmology and ASC communities, are in the process of developing and proposing new and appropriate ophthalmic ASC measures. One such measure isUnplanned Anterior Vitrectomy, which assesses the percentage of cataract surgery patients who have the procedure in an ASC. CMS is soliciting comments on this outcome measure for future consideration. We remain vigilant in our position that any ASC quality measure should relate to the episode of care within the ASC, encompass data that is available within the ASC, be collectable by ASC staff, produce conclusions that are actionable by the facility and have been tested on a pilot basis in the ASC. ASCs that implant lenses that have secured NTIOL status receive an additional $50 in facility reimbursement. 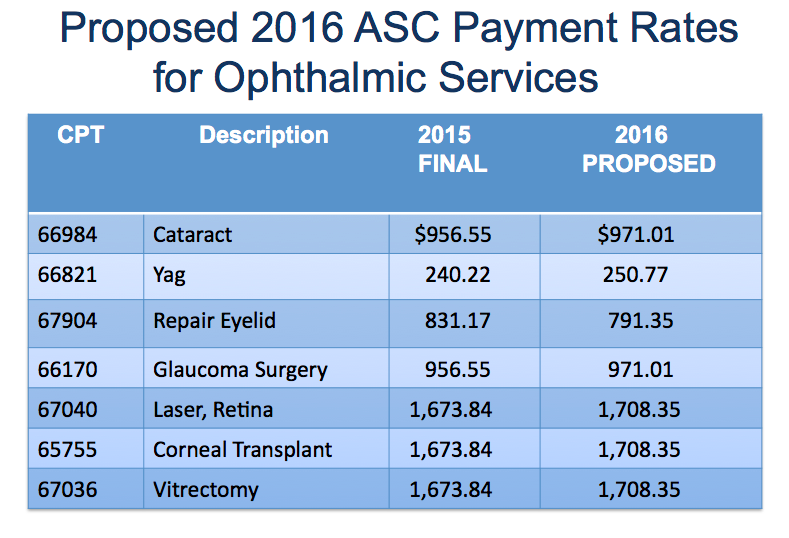 CMS reports that there were no applications submitted by ophthalmics manufacturers requesting NTIOL status for lenses for the 2016 ASC payment rate rulemaking. CMS has proposed the adoption of a new criterion for evaluation of manufacturers applications for NTIOL status. Specifically, the agency is proposing that, beginning January 1, 2016, an NTIOL application will only be evaluated by CMS for a new IOL class if the IOL has received initial FDA premarket approval within three years prior to the NTIOL application date. CMS is proposing that, effective CY 2016, separate payments to ASCs and HOPDs for corneal tissue acquisition costs would be limited to tissue used in the corneal transplant procedure and not for non-transplant procedures. The agency clarifies that it will make packaged payments for all tissues used as patch grafts in glaucoma shunt surgery. We are disappointed, but not surprised, by the proposed regulation, with respect to both the size of the update and the agency’s failure to adopt the Hospital Market Basket for ASCs. OOSS will submit comprehensive comments on these and other issues.